Back when I was still living with my family in Canada, I made it a habit to regularly watch any new anime titles that I could get my hands on. When anime really started to become popular about 10-12 years ago, I was always on a quest to find a good video or DVD to watch, which were of a much higher quality than the fansubs that had been floating around the local flea markets up until that time. Finding them wasn’t a particularly difficult thing but getting someone to watch them with me was. Of course my parents showed absolutely no interest in anime and my brother conveniently disappeared whenever I watched it. My sister, on the other hand, could be easily bribed. She hadn’t been too fond of subtitles at the time and complained about having to read them and keep up with the action on the screen. But, if I laid out some potato chips, popcorn, and a coke float for her as a means of converting the dreaded ‘anime time’ into snack time, I had no trouble bribing her. However, even if she was sitting there to keep me company she did occasionally find an excuse to escape halfway through or fall asleep without me noticing. Needless to say, I wasn’t able to successfully introduce any of my family members into the world of anime. Now, about five years later, my sister suddenly emails my cell phone with a very peculiar question. She wants to know if I have the Ghibli movie Sen to Chihiro no Kamikakushi (or Spirited Away in English). With all those exclamation marks and emoticons following this seemingly innocent question I think that it’s perhaps urgent for some reason. Why does my sister want to know if I have Sen to Chihiro? Weird! I reply in kind by confirming that I do indeed own the DVD and why does she want to know… followed by more exclamation marks and emoticons. The next email I get from her is so totally out-of-character that I ponder over asking her if she’s maybe been studying too hard. She kind of requested that I relinquish my DVD if I’m not watching it anymore. Thankfully, I was able to remind her about the difference in DVD regions between Canada and Japan and then gently add that I’m obsessive over all my Ghibli movies. She was just going to have to put in another order to Amazon.ca in order to fulfill her strange- and sudden – interest in Sen to Chihiro. But what was with the sudden change? Apparently, Ghibli had the power to convert my sister into an anime fan overnight. She’d seen a few clips on the Internet on youtube.com and was blown away by the artwork of the movie, especially the vast range of expressions and movement that the characters were capable of. It was unlike any anime that she had ever seen and she was drawn to Chihiro’s charming and entertaining tale. Becoming desperate after realizing that she wasn’t going to be able to leech my copy of Sen to Chihiro off of me (leeching is usually a sister’s unsaid duty), my sister did just as I recommended. She rushed onto Amazon.ca to put the DVD on rush order. She couldn’t find it at any of the local DVD shops and didn’t want to wait for the free delivery. I guess that my sister and I are very alike when it comes to impulsive behavior and sudden shopping urges. My sister isn’t the only person who has been inextricably attracted to the creative worlds and characters that Ghibli continues to conjure up to this day. Since our last conversation, she’d not only thoroughly enjoyed watching Sen to Chihiro but had also gotten her hands on Totoro. I’m thinking that all we’re going to be discussing in the next while is going to be how she can import merchandise like clocks (she’s already asked for a Totoro one), handbags, stuffed animals, and cell phone straps. Many of my students – a percentage far higher than I’m confident at guessing – confess to being in love with the movies created by Ghibli. People who have absolutely no interest in anime are constantly listing Totoro, Laputa: Castle in the Sky, and Princess Mononoke as one of their favorite, or most beloved, movies of all time. Students at Smith’s School of English Kyobashi – of all ages and professions – take notes with Totoro stationery, carry their pens and pencils in a fuzzy Neko-bus pencil case, and write with colorful pens that have Ponyo swimming along with their pen strokes. Many of them relate these movies to a nostalgic memory, a time in their childhood, and family qualities. Although I have a number of anime shows that I really like, I probably wouldn’t watch them as many times as I’ve seen Totoro. Every Ghibli movie has a different theme, atmosphere, and unique characters to sympathize with and grow attached to. I’m pretty sure that I’ve watched just about every movie that was ever created by them… unless I missed one somewhere. My absolute favorite is Sen to Chihiro because of the lively animation and the plight of the main character. Each scene in this movie is highly imaginative and quite emotional. After watching a few minutes of the opening scene, you kind of get a feel for the mood that Chihiro is in and are sucked into her world for a solid 125 minutes. After a while, I begin to think that maybe I’ve met this Chihiro somewhere before because her personality, actions, and expressions are so lifelike. Come to think of it, she does bear a striking resemblance to one of my former students who had been around the same age at the time. So what is this movie about? Basically, it’s about a ten-year-old girl who is ‘separated’ from her parents (if I say exactly how this happens I’ll be giving away the story) and has to struggle on her own in a very strange world in order to be reunited with them. She is met with many overwhelming obstacles that an adult twice her size and with twice as much worldly experience might have difficult conquering. But you’d be amazed at what this little girl is capable of. And then there’s Totoro and Howl’s Moving Castle. I’m going to have to list both of them as being my second favorite Ghibli movie because they’re both wonderful films. And of course, they’re both filled with magic and the dramatic escapades that their characters get up to. With Totoro, the movie focuses on two young girls and how they are able to cope with moving to a new home far out in the countryside. Satsuki, the older sister, must assume the role of playing the mother figure to her younger sister until their mother is well enough to return home. She is also burdened with the tasks of cleaning, cooking for her family when her father sleeps in, and regularly attending classes in a school quite a distance away. Life seems to be quite normal until her younger sister Mei stumbles upon a really large creature that proves that there’s a lot of mystery and magic in their new quaint home. Howl’s Moving Castle definitely jars my imagination in terms of thinking of the future whenever I watch it. The main character, Sophie, has a relatively boring life full of routine while she goes from day to day, tending to her father’s hat store. She considers herself to be plain and unattractive and therefore doesn’t react too panicky when a spiteful witch curses her with an evil spell. Sophie is forced to consider herself in a new light when she is changed by the curse. Luckily for her, there is a magician named Howl who might be able to help her with both the curse and finally accepting herself for who she really is. Whenever I witness Sophie’s transformation scene, my mind begins to wander, drawing up images of what I might look like in another twenty or thirty years. Ghibli’s latest animated movie to hit the big screens this summer was Ponyo, which was completely hand drawn and created without any computer enhancements. This most recent film not only relied solely on hand drawings but produced an incredible 170,000 individual images, which unsurprisingly set a new record. 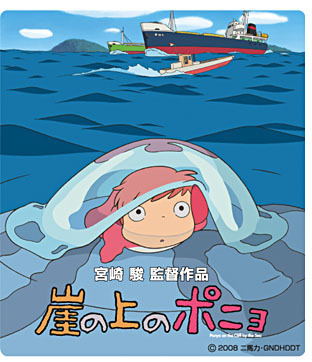 As with any previous Ghibli film, Ponyo has already amassed a large group of fans and publicity. Ponyo was the first Ghibli film that I ever watched on the big screen so I was really caught off guard when I showed up to see it two weeks after its release and was forced to wait in a line that wrapped around the building in order to reserve seats. By the time I reached the ticket booth, four hours of showings had already sold out! So I bought my tickets and whiled my time away shopping until the indicated time. When I got back, I felt really intimated to see the hordes of people that were dying to get inside the theater doors to watch Ponyo. All 767 seats had been sold out so not a seat was empty by the time the previews were done. Add to that the fact that it was playing in two theaters at the same time and you can probably imagine the numbers. So what can I say about Ponyo? First of all, I’d really like to see it again. The movie was really endearing and cute, proving to be a more light-hearted Ghibli movie than its predecessors. Hayao Miyazaki, the filmmaker who was responsible for creating nearly all of the Ghibli movies, definitely lived up to his reputation with this movie. The scenes, although hand drawn, are more visually astounding than many anime that are enhanced by computer graphics. The emotions, movement, and colors are just as impressive as Howl’s Moving Castle, but unique in their own way and style. Before Ponyo, Hayao Miyazaki was said to have retired so this movie was a welcome surprise for fans of his and his movies. I can honestly say that I doubt that either Hayao Mizayaki or Ghibli Studios will ever run out of steam where their animations are concerned. Every movie they come up with is fresh and new, and completely unexpected regarding the storylines, animation, and injected morals. Where do diehard fans of Ghibli go when they aren’t content with just watching the movies and buying the merchandise? To Tokyo, where else?! Or more specifically, to Ghibli Museum, Mitaka. 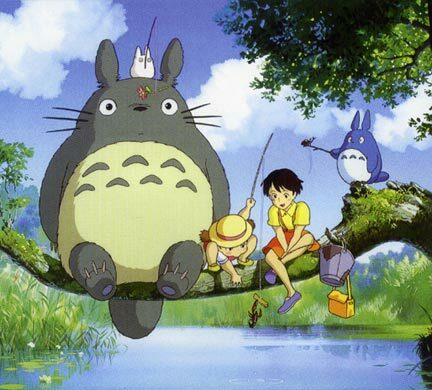 This is really an enchanted place where you can expect to find Totoro, Neko-bus, the robot soldier from Laputa : Castle in the Sky, and many of the other popular characters that have appeared in the Ghibli films. This museum is so popular that you have to book and purchase your ticket before setting out for it to ensure admission at least several days in advance. Not only are you able to see displays from the movies, but you’re also able to buy art books and other merchandise, including The Art Collection of Ghibli Museum with many cells and prints from the movies. So if you like museums and are fond of, or interested in the world of Ghibli, this might just be the perfect sightseeing attraction for the upcoming winter holidays. For something like this, you might think that it’ll be outrageously overpriced, but actually it’s extremely reasonable. For those of us 19 years of age and older, admission is only 1000 yen. I think that it will be well worth it if I can manage to get over to Tokyo during my New Year’s holidays. Aside from my husband, who is also a major Ghibli fan, I can think of a fair number of friends who might also be interested in the trip. In the meantime, I may just watch Ponyo a second time for my birthday so that I can bask in the cheerfulness of the energetic little fish-girl who lives under the sea. Thanks for sharing the magic of Ghibli with everyone. You should put this in the “Life in Japan” section. Personally, Totoro was the first Ghibli I saw and it made me an instant fan. Being able to create movies that are enjoyed by EVERYONE is a truly aazing thing. My favourite Ghibli anime is “Pricess Mononoke”, although all of them are excellent.